On Wednesday 26th a presentation was made to 1st and 2nd year parents/guardians about the new Junior Certificate structure including CBA's. A copy of the presentation may be viewed here. Leaving Certificate Orals will be taking place in school from the 25th of March onwards. Students are reminded to check with their subject teachers for individuals times/dates. 6th year students from St Ciarans will be attending the Irish Times Higher Options conference in the RDS this Thursday. 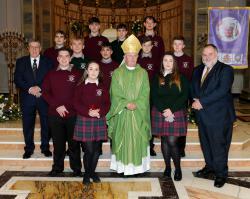 11 students from St Ciarans were awarded medals for their participation in the John Paul 2 awards. Rory McGee and Caroline Kiernanan received the highest award, the Papal Cross from Bishop Michael.